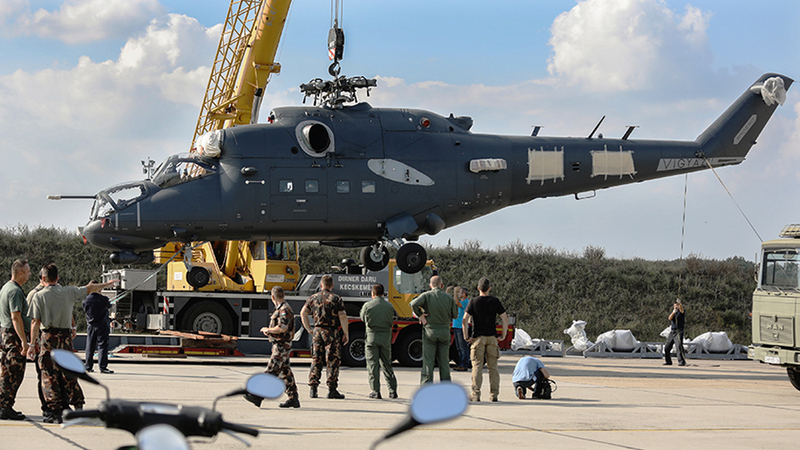 Four overhauled Mi-24 "Hind” attack helicopters were recently delivered to the Hungarian Air Force base at Kecskemét aboard a VKS (Russian aerospace forces) An-124 strategic airlifter. From there they were transported by road to the Szolnok helicopter base. The two Mi-24Vs and two Mi-24Ps are the first of a batch of 12 Mi-24s to be overhauled for the Hungarian Ministry of Defence (MoD), which signed a contract with Russian Helicopters last fall. According to the contract, the 12 aircraft are to be completed within 10 months. Brigadier General Jozsef Koller, the Szolnok base commander, told the media that the project was "a bit more than an overhaul” but that he would not call it a modernization. The work on the Mi-24s is being done by the St. Petersburg-based AO 419. ARZ enterprise and will serve alongside the 20 Airbus H145Ms ordered by Hungary. Equipped with HForce kits, the H145Ms will gradually form the backbone of the HunAF’s helicopter assets, providing close-support. The 12 refreshed Mi-24s are expected to remain in active service for at least another seven years. The roles of the Mi-24s will be expanded. They will be deployed in emergency situations such as floods and other natural disasters to support the civilian population, Koller added. The six Mi-24Vs and six Mi-24Ps are part of the Zrinyi 2026 program of upgrading the Hungarian Armed Forces with new capabilities and modern assets. The Mi-24s had been grounded (but not decommissioned) for more than five years, having reached the end of their original airframe lives. In the meantime, successive defense ministers had varying ideas concerning a helicopter strike force, and there was a lack of proper funding to finance any overhaul. After fielding the 12 Mi-24s and commissioning the 20 Hforce-equipped Airbus H145Ms, Hungary will have one of the largest and most modern rotary-wing close-support capabilities in the region. During the live-fire exercise held in late July 2018 at the Várpalota training ground (that Airbus uses as a demonstration range for prospective customers such as Australia, Kazakhstan, and Thailand), Airbus representatives told AIN that Hungary has ordered the most advanced of the three available HForce options. It provides the pilot and the gunner with the capability of deploying ballistic and guided ammunition, with the gunner using the EOS (electro-optical system) and the pilot firing guns using the HMSD (monocular helmet-mounted sight and display). While the overhauled Mi-24s lack these capabilities, they have powerful onboard weapons systems such as the Yak-B four-barrel 0.50 cal rotary machine gun, GSh-30-2 fixed twin-barrel cannon (Mi-24P), as well as S-8 unguided rocket launchers and 9K114 Shturm (AT-6 "Spiral”) radio-guided anti-armor missiles. An English-language display/computer system providing integrated access to navigation and communication systems was built into the overhauled HunAF Mi-24s by the specialists of the AO 419. ARZ.